RHYS BOWEN: I have just returned from a vacation in Europe that included two weeks on a secluded bay in Corfu, a Greek island. Two weeks of doing very little except for sitting on my balcony reading, eating at bayside tavernas and lying in the warm waters of the Ionian sea. To make it more special our apartment belonged to the White House, which was where Laurence Durrell lived in the 1930s and where he wrote Prospero's Cell. Everything was perfect except the beach was stony, not sandy. So I realize I am being very picky but I started to wonder whether I had ever been to a perfect beach and what a perfect beach should look like.I once saw what I thought was a perfect beach near Darwin in northern Australia. But nobody was on it. I asked a park ranger whether it was okay to go swimming there. "Of course you can," she replied, "If you don't mind the sharks, the crocodiles or the jelly fish." Okay, there are certain things the perfect beach shouldn't have. Sharks, crocodiles and jelly fish for starters. But what should it have? Clean water, for one thing. I went snorkeling on the island of Bali and was horrified to find so many plastic bags caught up on the coral. .My contenders: the beach on Whitsunday Island, Queensland. Pure white sand. Tree lined. Only the occasional monitor lizard to make it scary. Hanauma Bay on Oaha used to be a favorite until it became a national park and is now crowded with newby snorkelers. The beach at Noosa on the Sunshine Coast in Queensland is another favorite. Unfortunately my brother moved away, so I don't go there any more. In Europe a little beach outside Nice (which is stony). It's called the Baie des Fourmies and is pretty darned nice.But in the US? California ocean water is all too cold for me. Some Florida beaches are contenders. Naples was nice but no shade. What does your perfect beach have to have and where is it? HALLIE EPHRON: I'm a California girl and spent summers body surfing in Malibu and Manhattan Beach, so those are still my perfect beaches. Broad white sand and wave after perfect wave that you can swim in front of, get picked up by, and carried forward so just your head sticking out as you coast onto the shore. Hold onto your bathing suit top. 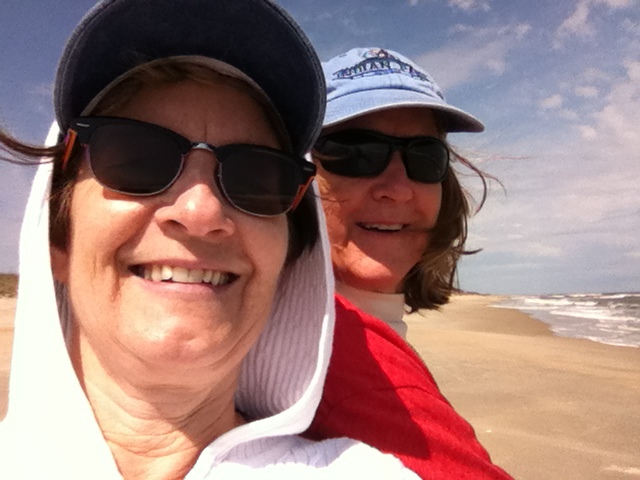 LUCY BURDETTE: I was imprinted on the beach near Hatteras, NC, which is the end part of the Outer Banks. We went every summer and spent hours roasting on the sand, and swimming--big rollers usually, and a perfect cool temperature. We'd be out there floating in the salt water and game would be to call out whether each wave was an "over" or an "under." The overs you could float over the top. The unders would grind you into the sand if you didn't dive through them. And the dunes are stunning too, planted with sea oats. Several families would go at the same time and we'd have enormous games of kick the can and pounce at night. Wonderful memories, gorgeous beach. HANK PHILLIPPI RYAN: Well, yeah. Out of the US? Easy. Easy! Nevis. It is..white sand. Turquoise water. EMPTY. The beaches are so unpopulated, they don't even have names. We named the one we go to, though. (Cleverly.) Beautiful Beach. Which says it all. There are palm trees, and we sit and read and watch the pelicans fly and soar and pounce, then shake their little tailfeathers when they catch a fish. My idea of a perfect beach is peaceful. This photo is Nevis--but it's very faded. Just up the chroma to intense blue and white..and that's it! In the US? Truro on Cape Cod. We go to the bay beach, and it is gorgeous. DEBORAH CROMBIE: Rhys, so jealous I am green. Sigh. Especially since we haven't taken a beach vacation in longer than I even want to admit... I didn't grow up going to the beach. Dallas is a LONG way from beaches, and my parents were into golf courses, not beaches. (Sighs again...) But there have been beaches that stood out. We stayed at a lovely place at the tip of Cozumel. White sand, palms, little rush huts to protect you from the sun, clear blue water that was lovely for snorkling off the beach if you didn't mind the friendly barracuda that hung out occasionally. But my favorite was a beach in Puerto Rico. Empty (this was years ago, mind) with lovely sand and palms AND the best thing was the hammocks strung between the palm trees... Beach, hammock, book=heaven. SUSAN ELIA MACNEAL: Not a well-known place, but the Canadian shore of Lake Erie is fantastic and where I went during the summer with friends while growing up in Buffalo, New York. These days, the family and I love the beaches of Narragansett, Rhode Island — which seems to be overlooked by tourists who opt for the Hamptons or the Cape (shhhhhh....). A day at the beach, then a lobster roll at Aunt Carrie's (now in its 95th year and going strong) — can't be beat. And outside of the US, the beaches of the west coast of Scotland are beautiful, especially near Arisaig. (Yes, beaches in Scotland! No, I'm not joking!) The water is warmer than you might expect, thanks to a Gulf current passing by and the beaches are fine white sand and gorgeous! You may spot a seal! JULIA SPENCER-FLEMING: Rhys, if you think California water is too cold, the Atlantic Ocean off the Maine coast would kill you! I want to propose a different kind of perfect beach: Old Orchard Beach, located in its eponymous town in southern Maine. It's a throwback to the old vacation beaches of the east coast: a seven-mile-long golden-sand beach with a century-old Boardwalk extending out into the ocean; an inexpensive, small scale amusement park, candy stores and ice cream stores and t-shirt shops in between art galleries and Italian sausage stands. It's definitely not about lounging in the sands with a cocoanut-flavored drink, but if you want to sample an old-fashioned all-American summer, you have to try it. I met Jessie Crockett, whom many of you know from Crimebake, and in 2016 she's going to have a mystery set in 19th century OOB coming out. So I know what will be in my beach bag when I go there next summer! RHYS: So there you have it. Our favorite beaches. Which is yours? 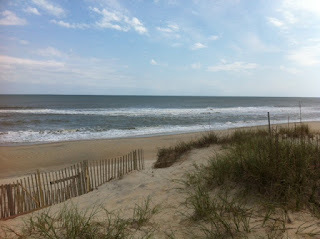 The Jersey shore with gentle waves washing up on long stretches of sand. Of course, there must be a boardwalk, with lots of shops and a bandstand. When I was growing up, I loved the carousel on the boardwalk in Asbury Park . . . .
Today I sat on a rock wall at Waikiki Beach and thought that there couldn't be any more perfect blues that the ocean there. I was truly mesmerized by its beauty. That blue is the first requirement for a perfect beach for me. The sand is good there, too. Beige and soft. Alcapulco in Mexico has that gorgeous water as well, but I've only been there once, and that was 35 years ago. It May have changed somewhat. Rhys, when I went back to Hanauma Bay after a lapse of 34 years, it had lost some of it's charm for me, and I suspect it was the overcrowding that accounted for the disappointment. Not that Waikiki isn't crowded, but it is more spread out. Susan, it's so funny that you visited the Canadian side of Lake Erie growing up. I visited the American, state of Ohio, side when I was growing up. Of course, that would have been in the late 50s/early 60s for me, long before the pollution problem with the lake. You probably hit it after the pollution problem. Joan, you reminded me of the bands that used to play at the grand old hotel where my family stayed while at Lake Erie. I love hearing about all the beaches you Reds have been to, so many more than I have seen. Old Orchard is a fabulous beach, and I have swum in the water there (Jessie hosts the Wicked Cozy Authors retreat at her house there once a year - and her new series is going to be a treat). My son took me to Crash Car Beach on the western side of Puerto Rico - warm water, gentle waves, and yes, trees at the back of the sand for shade. Delightful. And I grew up going to Huntington Beach in southern California, and the Wedge in Corona del Mar. Great body surfing! I'm actually treating myself with a morning at Jennessy Beach in Rye, NH, today. Long walkable sand, gentle waves. I'll have to bring my own shade, though. Best? No greenhead flies, which keep us away from most North Shore beaches during July - those suckers BITE. any of the National Seashore beaches on Cape Cod, even with frigid water. Oh, wait. It's Crash Boat Beach in Puerto Rico, not Crash Car. I think. A glorious one, either way. Kathy, that's so funny -- yes, we went to Lake Erie post-pollution (well, sort of....) in the 70s and 80s. We also went on the New York State side, but the beaches are rockier than the Canadian side. Email me at h ryan at whdh dot com--and I will send you WHAT YOU SEE! Everyone, thank you SO much--it was delightful and wonderful to see you all! My train from NYC to Boston Saturday went by --was it New London, CT? And there was a huge boardwalk and long beach with two piers, a strip of sandy beach, and they were having some kind of summer festival, with carnival rides and cotton candy and hot dogs, teeming with people and colors and balloons, and you could almost smell it through the train windows! It was like a glimpse into another world--very strange to see as we pulled away! Lake Erie shore, Ohio side. Parks abound, where you can walk or sit as long as you like and have your thoughts to yourself. New Smyrna Beach, Florida, Atlantic side of the state. Wonderful sand, family-friendly, not too crowded, no Spring-break crowds. Old Orchard Beach, tail-end of summer. I grew up in Southern California, inland. My parents twice rented a beach house (10 kids in the family) at Newport Beach, 30th street. This was/is a wide stretch of beach where the dory fisherman would sell out their catch before 9 a.m. As a teen, would spend 25 cents to take the bus here, all the way down Harbor Blvd. And as everyone else has commented, that water is cold, but not to a kid who'd been out in the sun all day. The Crab Cooker sold a "blue plate special" lunch for $2.00 (for me, that was equivalent to 4 hours of babysitting). Great memories; thanks for this post, Rhys! I'm not sure I have a perfect beach. I just love going to the beach period and don't do it nearly often enough, which is sad since I live in Southern California. Susan, my husband grew up going to the Ontario beach every summer - Sherkston. We went there for a bunch of years with our kids (until my son's recurring eye infection that was irritated by the sun on the water). It was lovely, aside from the times that the beach was choked by seaweed. My perfect beach? Several on in Puerto Rico, especially if you go to the Caribbean side. And if you go in the "off season" they are pretty empty. Silky white sand, warm blue water. Notable: Playa de Ponce and Luquillo. Also Isla de Culebra (although they had an unusual jelly fish problem the winter I was there). Sadly, Hanuama Bay in Hawaii has been largely destroyed. The coral, that is. Too many mindless day-trippers standing on it. Still pretty nice, but crowded and not what it was by any means. Grand Cayman does pretty well. Joan, how could I forget the Jersey shore? we went there for years and years, as I grew up in NJ. The beach was crowded, but the water wonderful. And the boardwalk provided endless hours of entertainment! 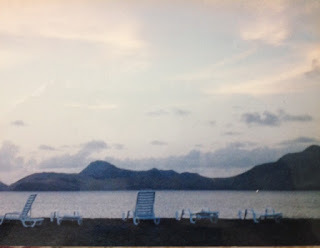 When we were young, we lived in Point Pleasant; my mom used to take us to this small, quiet, uncrowded little beach, a sort of an inlet where the water was always gentle. It was nice because there were no big waves and I wasn't afraid to go in the water there. [Once I took off my glasses I could never see the waves until they knocked me over.] When I was older, I sometimes went to the beach in Ocean Grove where my grandmother lived, but I am more of a walking-in-the-sand or along the boardwalk and riding the carousel kind of person. I simply don't do the beach/swimming thing. Hank, I love your description of the view from the train! I'm going to have to see if I can figure out exactly where that beach in Puerto Rico was... I think it was a Hilton resort, and there were two resorts side by side. You could walk along the beach from one to the other. And Susan, yes, Scottish beaches are beautiful, and the Jet Stream makes the water warmer than you would think. I've also been to quite a few English shingle (pebble) beaches, but they never seem quite right to me without sand. The beaches of North Florida -- called the Emerald Coast have sand like talcum powder and clear green water. The sharks usually stay on the other side of two sand bars. Go in September or October when the crowds have left towns like Destin, Seaside, and Grayton but the water is still like bath water. When I was a kid Galveston Island was a treat. Only 50 or so miles from Houston it was another world. Before we were allowed into the car for the trip back Mom would clean any tar off our feet. There were always spots of tar on the beach for us to step on. Nowadays given the time I'm more inclined to head down the coast to Port Aransas and Mustang Island. Cleaner water but still all the amenities. And wonderfully laidback. Mary, Sherkston, yes! And then a side trip to Chrystal Beach amusement park, of course! Old Orchard Beach in Maine is my favorite. There is something for everyone. Even at the peak of high season the beach is mostly empty before 9 in the morning and after 6 or 7 in the evening for those who dislike crowds. As Julia mentioned there are miles of unobstructed beach for walking, fireworks on Thursday evenings and old-time food and amusements. You can even arrive by train and walk just a block to the beach. Many people come without a car since so much is within walking distance and there is a trolley for those destinations just a bit further afield. In September, the water is usually at its warmest, and the crowds have all faded away, leaving the perfect place for a day of swimming, strolling and kite flying. Wow! So many great sounding beaches! I'd love to see them all. I'm taking a tour with my son-in-law's sister, who lives here on Oahu, of the Eastern Shore beaches. I've been all around the island on previous trips, but Laine is a girl who surfs a lot, so I know she will show me some good places. North Shore is my favorite. Maui beaches are the best. The west and southern sides of the island. Warm water and wonderful views, and many are not crowded! The city beach on Lake Michigan in Ludington, Michigan is beautiful. White sand, fresh water, no crocodiles, alligators, sharks or jellyfish. Sunsets are to die for. It is a little slice of heaven. It also has a lighthouse that you can walk out to. The Third Coast! Traverse City and beautiful Lake Michigan! How Many Zzzs are Enough? What If Nancy Drew Was 22 Years Old in 1968? Rhys Stays Sane, Or does she? Jungle Red Roll Call, count off now! What Does Brad Parks Blog Title Even Mean? Obsession. It's a Good thing. To See? Or not to See? Jungle Reds Picnic: July 4 Pot Luck!